Smog over Mexico City. 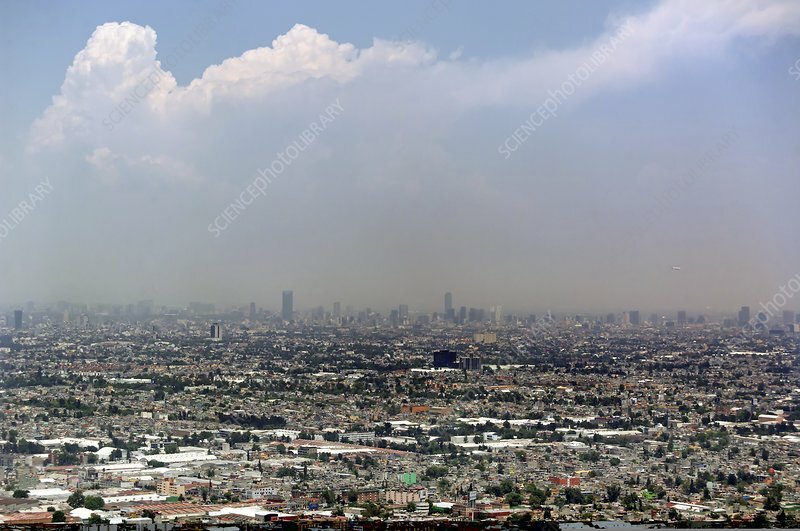 Clouds and smog (brown haze) over downtown Mexico City, Mexico. The geographical location of this city, within a highland depression (2420 metres elevation), allows cold air to blanket the area and trap urban pollution. This pollution is produced by motor vehicles and industries, and can reach high levels. Restrictions on driving and industrial output, combined with environmental policing and fines, have improved air quality since the 1990s. Mexico City is one of the largest cities in the world, with an area of 1485 square kilometres and a population in 2010 of over 8.8 million. Photographed in April 2010.